There is no significant difference between a hamburger patty and a hamburger steak, except the bun. The steak is a patty served without a bun. This gives you the freedom to treat it more like a steak by adding gravy and sauces. Broiling the meat will help sear the outside of the patty and create a distinctive dish that goes beyond the traditional burger. Preheat the oven to the broiler setting. Remove the packaging around the ground beef and crumble the meat into a mixing bowl. Add any seasonings you want for your steaks. For example, add a pouch of dry onion soup mix or salt and pepper. Other options include chopped onion, Worcestershire sauce or steak sauce to enhance the flavor of the beef. There is no right or wrong mix of seasonings. Use your hands to mix the ingredients throughout the ground beef. Grab approximately 3/4 cup of the seasoned beef in one hand. Roll the meat into a ball and then press it between your palms to create the patty. Continue this step to use all the meat in the bowl. Brush the patties on each side with olive oil and place them in a baking pan. Set the pan inside the broiler. Let the meat patties cook for 10 minutes. At the 10 minute mark, flip the steaks over and rotate them one-quarter turn. Bake for 10 more minutes. Place a meat thermometer into one patty near the center of the pan. When the thermometer reads 160 degrees Fahrenheit, the steaks are done. Remove the pan from the oven and allow the steaks to cool for a few minutes. 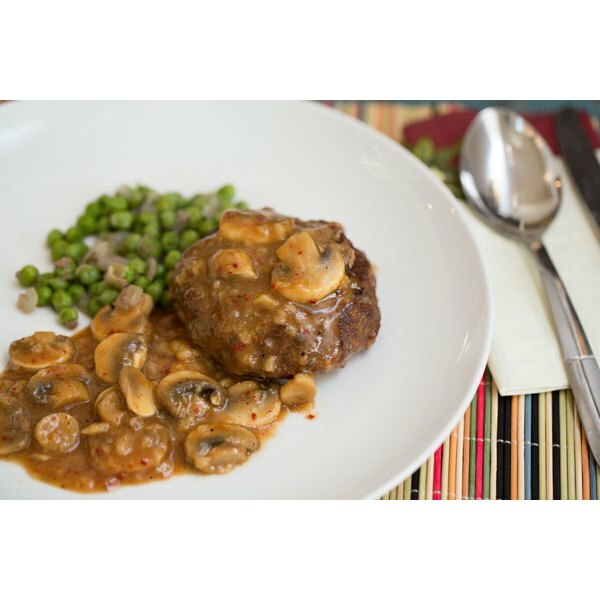 Add a mushroom--beef gravy to your hamburger steak to give it extra flavor. Use ground beef within 2 days of purchase, and use frozen ground beef within 4 months to prevent bacteria from having the chance to grow. Cook beef to an inner temperature of 160 degrees to make sure it is safe for consumption, as per the USDA Safety and Inspection Service.